Mountain Thunder 100% Kona 4 ounce coffee scrub helps remove dead skin cells and leaves you with a smoother brighter skin. Caffeine, when applied topically, constricts the blood vessels under the skin, helping to reduce eye swelling and puffiness. Magnesium in the Epsom salt reduces inflammation while sulfates flush out toxins. Salt scrubs are generally more abrasive because of their larger crystals and most effective smoothing rough skin. 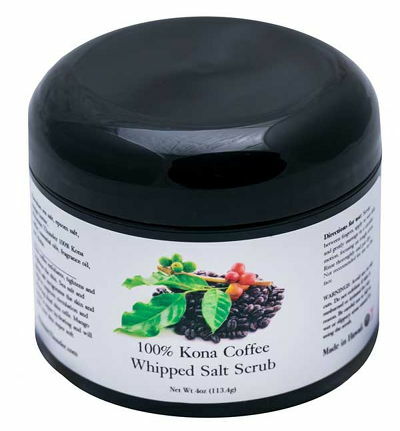 Hawaii sea salt and Mountain Thunder 100% Kona coffee invigorate the skin and help improve circulation. The reinvigoration process tightens the skin, helping give off a vibrant and healthy appearance. Directions for use: Scoop between fingers, apply to wet skin and gently massage in a circular motion. Focus on rough areas. Rinse thoroughly and pat dry. Not recommended for use on the face. Made with Aloha for Mountain Thunder Coffee Plantation in Kailua-Kona on the Big Island of Hawaii, U.S.A.